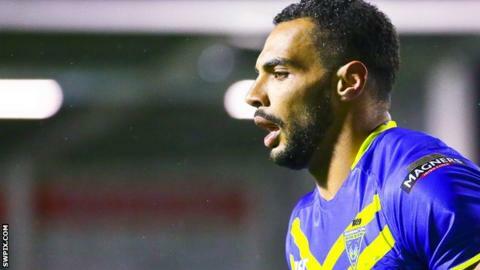 Warrington's Ryan Atkins has revealed that he was involved in a car crash while travelling to the Wolves' opening Super League game of the season. Atkins was in an accident prior to the 38-8 defeat by St Helens in February. And the 28-year-old told BBC Radio Manchester that it contributed to his poor form early in the campaign. "You don't want to be telling everybody your business, but I'm happy to say it now because I think I've turned the corner," said the England centre. "Before the first game of the season, I had a crash on my way to the game. "It's not an excuse, but nobody knew I'd been in an accident with my girlfriend and my baby - I had to leave them at the side of the road to get to the stadium. "The following week [against Leeds] I was trying to rectify everything from the first week and it all just snowballed from there. I felt like I'd let myself, the team and the lads down." Atkins, who has appeared in two consecutive Super League Grand Finals for Warrington, feels he is returning to somewhere near his best form. "I was all ready for a big season and it just didn't happen for me," continued the former Wakefield player, who has scored two tries for the Wire this season. "I spoke with Tony [Smith, Warrington coach] and some of the other lads, and I'd like to think I'm progressing to somewhere near where I should be performing. "I'm getting that confidence back and hopefully the old Ryan will be coming back." Warrington host local rivals Widnes on Friday without injured duo Paul Wood and Simon Grix. Prop Wood has a torn bicep, while versatile forward Grix dislocated a shoulder against Hull KR last time out, and coach Smith says both players could be out of action for around 10 weeks. Joint-captain Ben Westwood is already out for a month with a calf problem.